If you are an alpinist or you trekked a little bit in the mountain, for sure somewhere you tried the famous “classic mountain hut dessert”! We can consider other classic mountain hut food, like for example the over boiled pasta, the lasagna with the meat of the day before, the smelly socks soup, the dolomite goulash (lasagna the day after), but nothing is comparable and so “classic” as the “classic mountain hut dessert”! I am speaking about the small glass cup with inside the succulent canned fruit salad that you can have in every mountain hut in Europe. 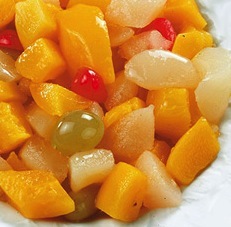 How you can finish a very hard climbing day without a classic canned fruit salad? The classic mountain hut dessert? You are coming in Japan to climb. You are staying in a nice mountain hut with ofuro, tatami and futon. For dinner, after a hard climbing day, you are having noodles, strange roots, rice with pickles, miso soup. You are forgetting about the classic mountain hut dessert, also because the Japanese are not eating dessert, come on!!! You are relaxed, ready to go to the tatami to sleep…..and ZAP!!!! the classic mountain hut dessert is appearing….you can’t believe it….you are astonished…how it could happen this now????????? And suddenly you are feeling HOME!!!!! This entry was posted on Thursday, July 4th, 2013 at 10:44 am	and posted in Uncategorized. You can follow any responses to this entry through the RSS 2.0 feed.